As soon as I connected to KGS, about 40 minutes before play in this tournament was due to was due to start, I realised that it was "April Fools" day. In the past, KGS has celebrated this by changing its graphics, using pink and purple stones instead of black and white. That was amusing and popular – and did nothing to interfere with its normal operation as a Go server. This year, there were two changes to KGS. The font which users use to chat had been changed, to one which made text in the Latin alphabet hard, though not impossible, to read. And many room names had been changed in a jokey way, in particular the "Computer Go" room had become "Confuser Go". I did not consider either of these amusing. The essence of an "April Fools" joke is that some people are fooled: they don't understand what is happening, and are puzzled, until they realise that it is deliberate. But with two (rather poor) jokes, it was immediately obvious that it was deliberate. I did not notice any users who were fooled, though admittedly, with the changed font, I did not make much effort to read what they were typing. The consequences for the Computer Go tournament were severe. Two bots had been left running in what had been the "Computer Go" room when they had connected to KGS, and was now "Confuser Go". A helpful user connected after the name change, found that there was no "Computer Go" room, and created one; and some bots using their normal .ini files had joined this. I think one of these bots was also unattended, so I had no way to explain to its operator what was happening. A KGS admin who had realised there was a problem (perhaps alerted by my appearance early on a Sunday morning) tried to rename "Confuser Go" back to "Computer Go"; and failed, because a "Computer Go" room already existed. Although several admins realised that this was an urgent problem, the font change made it hard for us to chat to each other about how to fix things. Eventually we renamed "Computer Go" to "not Computer Go", left a message in its room info (where the font was legible) telling bot operators to go to the real Computer Go room, and then renamed the "Confuser Go" room back to "Computer Go". But this still left three bots in the wrong room, one of them with no active operator. I kicked these three bots, and was pleased to see them reappear in the correct room. Meanwhile, Erik van der Werf asked me (after the deadline for registrations) whether stv (his program Steenvreter) would be welcome to play. Normally I would have refused, as this was after the 30-minute deadline before the start of play, and would result in an odd number of registered players. But at the time I could not be sure how many of the registered players could be got into the right room anyway, so I accepted. I apologise, on behalf of KGS, to all bot operators for the difficulties caused by the "April Fool" changes. I apologise particularly to those who do not normally use the roman alphabet: you must have been inconvenienced even more than I was by having to read a distorted form of it. I thank you all for your tolerance. Partly because of the difficulty of reading users' comments, I followed this tournament much less closely than I usually do. Therefore I have little to say about any of the games, and my report is short. In round 7, oakfoam played move 82 against stv as shown to the right. This seems strange. It threatens to start a ko to win the semeai with Black's lower left group. It seems that playing at a5 instead must be better (though still pointless): a5 threatens to win the same semeai outright. But there may be a reason to play at a6 rather than a5. I recall having a similar move played against me in a tournament, when I was 5-kyu. My opponent had realised that I would notice and answer a direct threat, and hoped that I might fail to notice a threat which only worked in ko. 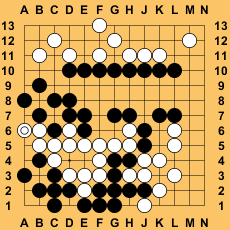 Is it possible that MC-based move generation can generate such a move, with White realising that a5 will always be answered and will therefore achieve nothing, but finding that a6 is ignored in some roll-outs, giving it a chance to win? Stv was not fooled. It responded at a4, winning the semeai. In round 10, stv beat Zen13 by half a point. This was Zen13's only loss. In round 11 oakfoam stopped moving in its game with Zen13, and lost on time. I later learned from its operator that it lost its internet connection, and was unable to reconnect to KGS for the rest of the tournament. In round 12 oakfoam did not join its game with ManyFaces1, and lost on time.